Genea-Musings: Dear Randy - Newbies Need to Be Warned! "DNA has been instrumental in discovering new relatives who are NOT family researchers. Newbies need to be warned about the dangers of importing trees that may contain errors. 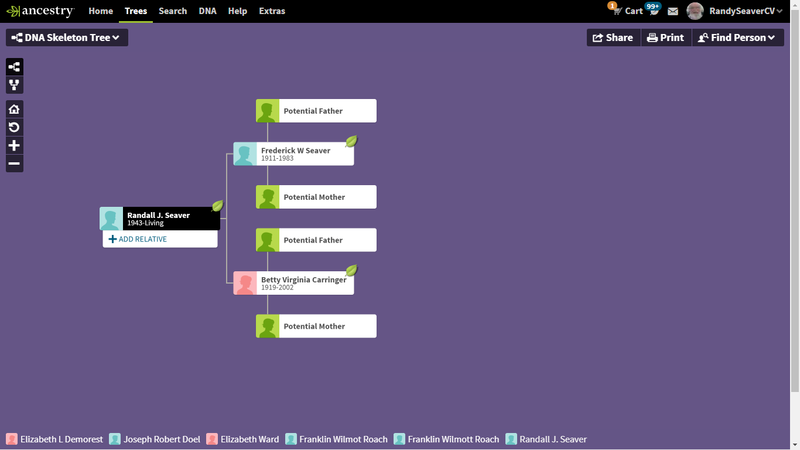 "One of my new family members has created a tree - fine - but has assumed that all Ancestry trees are accurate and he has imported a line based on some of our family names that includes Mary Todd Lincoln and other ancestors going back to Scottish nobility. ('I’ll bet you didn’t know we’re descended from famous Scottish Nobility.') His 'un-sourced research' is based on gleanings from Ancestry trees and Wikipedia. He wrote...'Most of the time I just wait for it to tell me there’s a Potential Parent, compare the names and dates and accept their recommendations if it all matches perfectly.' EEEEEEeeeeekkkk! I don't hear from him much any more and he is perpetuating the rumors throughout the family. Giving him the benefit of a doubt...he may have made some important discoveries, however I see no 'proof' - am I wrong? "I know there have been articles/blogs/webinars addressing this - will you point me to some?" I feel your pain and agony and frustration! I see it every week at my local genealogical society meetings and online. * How Accurate Is an Ancestry Quick and Dirty Tree? (posted 5 November 2018). In the Quick and Dirty Tree post, I found that five of my 64 ancestors (back through 4th great-grands on my father's side) were wrong just using Potential Ancestors suggested by Ancestry. That does not give me confidence that they should be used without doing a lot of research - they should only be used as clues for research. * Ancestry.com Suggests "Potential Ancestors" For your Ancestry Member Tree (posted 19 June 2018) I did find that two of the many Potential Ancestors suggested by Ancestry were correct. Others may be correct, but I have seen no conclusive evidence for many of the suggested potential ancestors in my Ancestor Member Tree. A 5% to 10% error rate in "Potential Ancestors" seems to be the norm, not the exception. Is that "good enough?" I don't think so. * A Reader's Take on Ancestry.com Problems - Part IV: The Ancestry Big Tree (posted 13 February 2019). That post explains how we know that there is a BIG Ancestry Tree and what is in it. 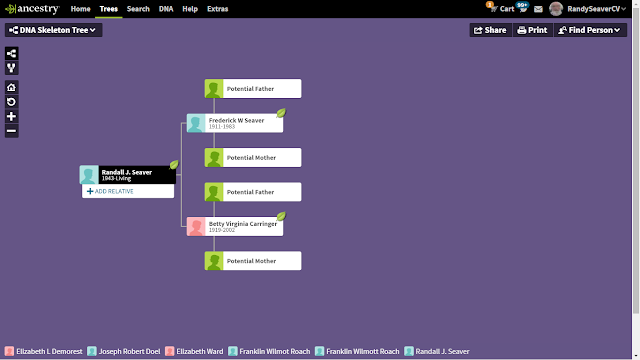 That BIG Ancestry Tree is used for the Potential Ancestors in Ancestry Member Trees, for the ThruLines DNA common ancestor feature, and for the We're Related mobile app, plus for a Google search for a person profile. Again, a 5% to 10% error rate appears to be the norm, not the exception. 2) Other writers and bloggers may have written about these topics; I don't keep a bibliography of things like that. You might do a Google search with suitable search terms. Or you might look through my Best of the Genea-Blogs weekly posts because I tend to pick blog posts about these topics. 3) Every newbie will benefit from reading "how to" books like the Val Greenwood classic, The Researcher's Guide to American Genealogy. 4th Edition. There are many more genealogy books (for beginner, intermediate, advanced and professional researchers) available at public libraries (city, county, region, state, etc.). 4) Every newbie will benefit from taking a beginner's course in genealogy - many local, state and regional genealogical societies have classes every year. Have your cousin look for a nearby genealogical society. 5) There are quite a few "Beginner" videos online in the FamilySearch Learning Center. You can search subjects like "beginner" or "sources" or "census" or "England" or or "church records," etc. You might recommend the video "If I'd Only Known - Beginner Genealogy Mistakes." There are many more videos online on YouTube - just search for "genealogy." The big companies (Ancestry, MyHeritage and Findmypast) have "Help" sections on their websites to provide education and information. * Learning and sharing of experiences in a group of researchers at a repository or in a genealogical society. * Making basic research mistakes and learning from them. 7) All of that contributes to the knowledge base of each person. I've seen it said that it takes about 10,000 hours of study and experience to be competent in any subject, and I think that's true of genealogy and family history. 8) I know that many Genea-Musings readers have suggestions for books, periodicals, and websites that they can recommend for a "newbie genealogist" - please share them in Comments to this post. Randy, I agree with #3 - Val Greenwood's The Researcher's Guide to American Genealogy, 4th edition. I think all researchers should read this book. I'd also recommend reading journals like that of the National Genealogical Society and New England Historic Genealogical Society's Register to read examples of well done research. If a newbie doesn't want to invest the money in joining, local societies and libraries often have past issues of the journals on their sale tables for not much more than $1 each. Joining a local society is another must do to learn more about genealogical research. It's difficult to approach the issue with someone who seems to be naive about genealogy. When someone tells us with a big grin, "I just started on Friday night, and I've already learned that Charlemagne was my ancestor," where can we start? How can we possibly be gentle enough so we don't turn the person away from family history (and US) permanently? Is there any point in saying something like this? "Man! I've been taking classes, reading text books for ten years, and spent so many vacations traveling to archives around the country. But I haven't found my great-grandmother's maiden name. I've just had a hard time finding any handwritten documents about my family before 1850. Getting real proof of relationships is tough." Is that hint too gentle to break through the ecstasy of Charlemagne's descendant? Even experienced researchers, whose education about other subjects I really look up to, seem to think that there aren't any sources beyond Ancestry.com. They have asked why I would need to document a particular fact with a citation on my Ancestry tree, because Ancestry documents them for me automatically. I would also add the suggestion to find a local genealogical society and check out their programs and educational programming. Marian said it succinctly. I’ve had the exact same experience with a new research, telling me excitedly "I’ve got my family back to the 1400’s and I’ve only been doing this for a month." Wow! Where to start? How not to offend them? I can’t even identify the parents of my maternal great grandfather or my paternal 2 great grandfather, after 16 years of diligent research and hiring 3 professionals. They hear me say that and just think I must not be very good at research. The proliferation of bad trees is only getting worse. All we can do is continue to guide them and hope for the best. Meanwhile, I’ll still be documenting my sources, attending seminars and classes and collarberaring with other genealogists.